If you are registered for the CSEM conference you are also welcome to attend this session. In hopes of improving communication skills between healthcare professionals and people with type 1 diabetes, the T1 Diabetes Think Tank Network (T1DTTN) was created as an innovative not-for profit collaboration between healthcare professionals and people with Type 1 Diabetes. This is the first event of its kind in Edmonton where we will bring together a select group of people living with Type 1 diabetes with endocrinologists, diabetes educators, and other healthcare professionals in an open, safe, non-judgmental setting to share experiences. The objective is to define, understand, and most importantly, improve the outcomes of the T1 patient journey. The findings will be presented at the International Diabetes Federation World Congress in Vancouver, December 2015 and will be used to improve the quality of type 1 diabetes care in Edmonton. 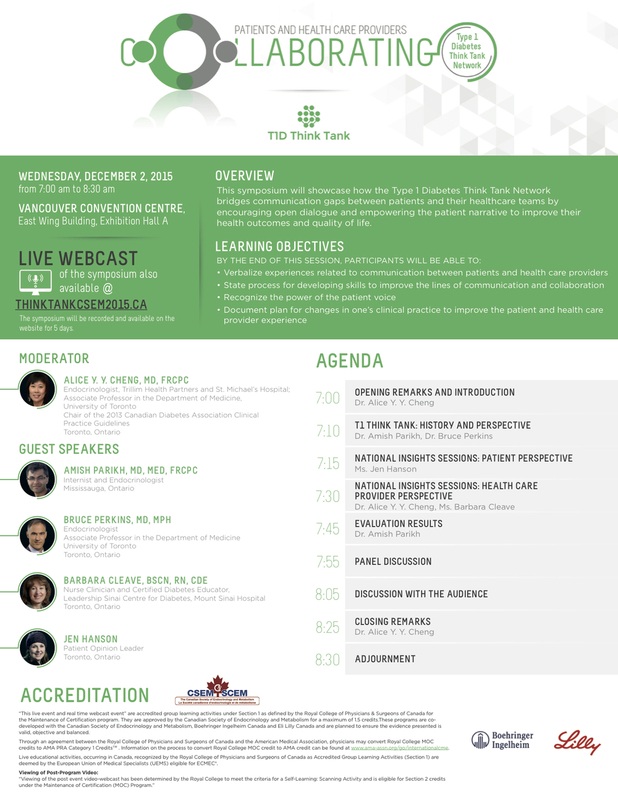 This special event is being organized in collaboration with the Edmonton Zone Alberta Health Services community of health care professionals and the T1 Diabetes Think Tank (T1DTTN). Please register below. In order to protect your privacy, T1DTTN does not have any of your information and will only contact you if you register online. We hope to see you on September 25, 2015 and together make a difference in the treatment of this challenging condition.